Acrivarn’s versatile rotating rack ovens incorporate the latest developments in baking, roasting, steaming and cooking technology to deliver consistent results with minimal weight loss. 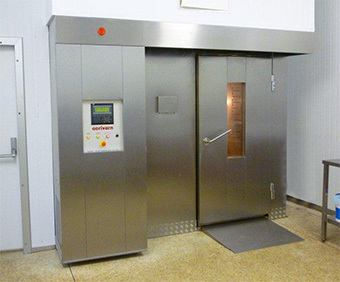 Our ovens are suited to the manufacture of all bakery products including bread, cakes, confectionery, savouries, pies and biscuits. When specified, the oven will roast and steam cook meat, fish and poultry products in joint form, bagged, open or individual pieces, diced or minced. Available from 1-10 racks capacity, the rack ovens can be powered by natural gas, LPG, oil or three phase electricity and will accept standard UK racks, double trays racks, continental racks, Metre square and any special rack sizes. Acrivarn rack ovens are manufactured from high quality materials, predominantly non-ferrittic and high temperature stainless steel. 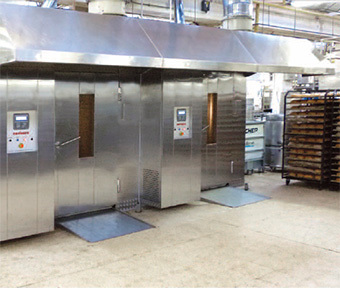 The ovens are fitted with large energy efficient heat exchangers to achieve a rapid temperature recovery after loading and to maintain low running costs. The airflow through the baking chamber is controlled by an adjustable louvre panel and is designed to give a totally even bake at all times. 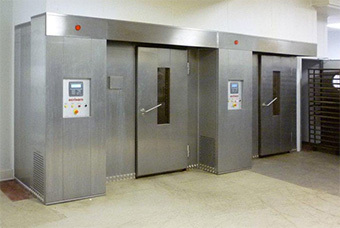 Acrivarn design, manufacture and install rotating rack ovens, proving cabinets, coolers and spinning disc glazing machines.